a) Halides of Phosphorus Phosphorus combines with allthehalogens forming phosphorus halides which are all covalent compounds. Phosphorus chlorides are more important. Tri and pentachlorides of phosphorus are most common. phosphoric acid depending upon the quantity of water. It is a white crystalline solid with garlic taste. 1. Acidic nature: It is a dibasic acid and gives salts of two types. prepared by boiling a mixture of red phosphorus with 50% nitric acid in a flask fitted with a reflux condenser on a water bath till no more oxides of nitrogen are liberated. cooled in a vaccum desiccator surrounded by freezing mixture when crystals of orthophosphoric acid are deposited. 1. It is a deliquescent crystalline solid. 2. It is soluble in water. 3. On reaction with silver nitrate, it gives yellow precipitate of silver phosphate. 1. It is used in the preparation of HBr and HI as a substitute for sulphuric acid. 2. It is used as souring agent in the preparation of soft drinks. 3. It is used in the preparation of phosphate salts of sodium, potassium and ammonium. 4. It is used in the manufacture of phosphatic fertilisers. acid to 523 K - 533 K.
It is a colourless crystalline solid. phosphorus pentachloride and it has a trigonal bipyramidal shape. reacts with C2H5OH gives C2H5Cl. 4. PCl5 is a better chlorinating agent. So it chlorinates copper. 5. 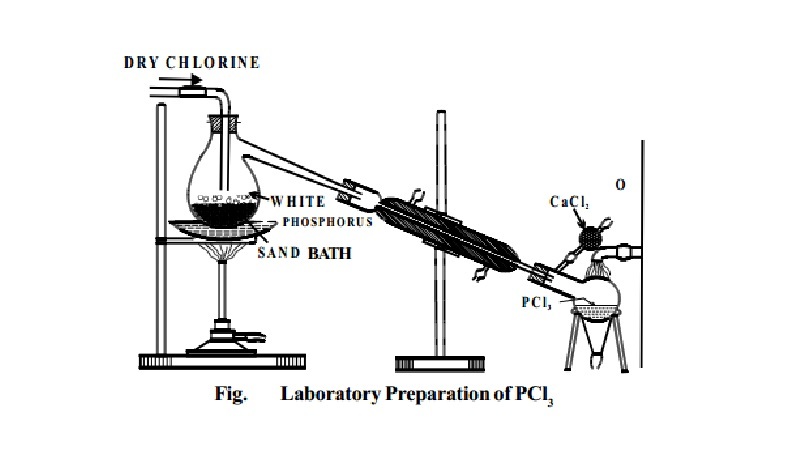 PCl3 reacts with SO3 and reduces it to SO2.